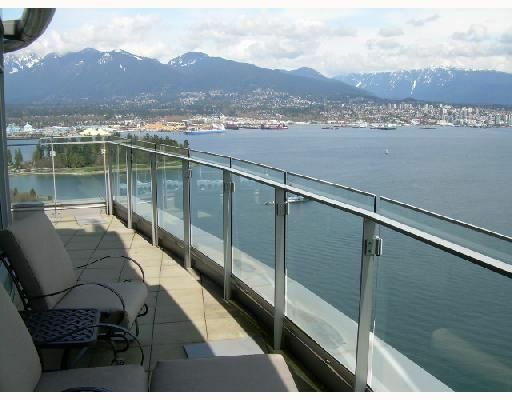 Absolutely spectacular luxury view-home with a one-of-a-kind partly-covered outdoor patio on the 33rd floor at Callisto. Join the exclusive club of owners at Harbour Green and enjoy breath-taking, unobstructed, forever views of Coal Harbour,Stanley Park and the North Shore. Entertain in high style in this 3 bedroom + Den + insuite-storage, 3 bathroom open-plan executive home W/hardwood flrs, granite counters and SS appliances. Relax in the spa-like retreat of your master suite or sip lattes on your huge, private patio. With cutting edge facilities, 24 hr concierge, secure elevators and bonus 3 secure parking spaces, it simply doesn't get any better. Balance of 2-5-10 warranty. Qualified buyers only, by appt.